On 21 September 2018, the company presented a cheque in the sum of £3050.00 to The Wallich homeless charity. 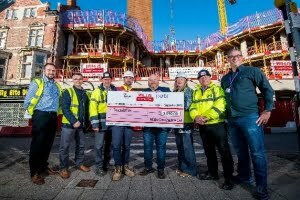 The company and its supply chain partners are currently building a development of older persons accommodation in Newport City centre and took the opportunity to support local homeless people through the donation to the charity. 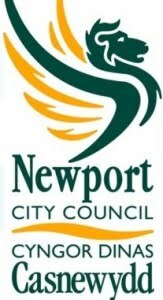 In April 2018, the company financially contributed to Newydd Housing Association’s Youth’s Project. The company is currently in a Framework partnership with the HA to deliver its WHQS planned maintenance works. In March 2018, the company partnered with the RSPB, St Peter’s Primary School and Cadwyn Housing Association to develop an ornithology project which led to the company installing 7 swift boxes beneath the eaves of the main school building. Also in January and February 2018, the company carried out an external environmental improvements project to re-vamp the garden at St Peter’s Primary School in Cardiff. The school is adjacent to a development of 48 apartments that the company is building for Cadwyn Housing Association and the work is being carried out as part of community added value support. The company is currently developing an affordable housing scheme in Talbot Green for Rhondda Housing Association and has donated materials and carried out landscaping works, including planting and a new fence, to an elderly neighbour’s property. in the development. The child was delighted with his gifts and designed a thank-you poster. In November 2017, the company donated Tesco gift vouchers to support Caerphilly County Borough Council and the Trussell Trust’s Christmas Foodbank Appeal. The recipients are young people moving into the first home after leaving care, vulnerable individuals and families in need. As part of a new-build residential development for Melin Homes, in June and July 2017, the company worked with the local primary school on a project to name the new street with the winning pupil receiving an award. The company also donated five gift vouchers for shortlisted competitors. 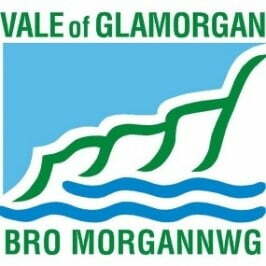 As part of a re-roofing Framework with the Vale of Glamorgan Council, we delivered various support actions to the communities in which it is operating. This included notifying a neighbour, Peterston Super Ely C/W Primary School, about a dangerously loose canopy. We then carried out the repair to the delight of the Headteacher. 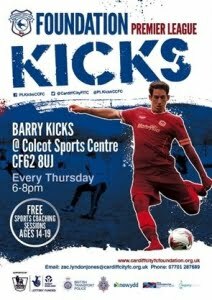 The company has sponsored the “Barry Kicks Project”, a two year (July 2015 to July 2017) partnership initiative between Newydd Housing Association, Communities First Barry, South Wales Police, Legacy Leisure, British Transport Police and Cardiff City FC Foundation. In addition to football coaching and competitions, the initiative offers a range of other positive activities to develop young sport enthusiasts along with developmental and educational sessions dealing with issues such as healthy lifestyles and the dangers of getting involved in alcohol and drugs. The 2016 tournament took place on the 15th and 16th February and culminated in the team being invited to take part in a national Kicks tournament against teams from Arsenal, Southampton and Plymouth. The creation of a video in July 2017 highlighting its social sustainability achievements as a feature for Cadwyn’s 2017 AGM and Tenant Fun Day. Cadwyn interviewed Jordan Phillips on one of the company’s sites that we are developing for Cadwyn in Cardiff. Jordan was interviewed because he was selected and interviewed in partnership with Cadwyn and then employed as an apprentice by the company. Jordan has recently completed his apprenticeship and is now a time served carpenter with the company. 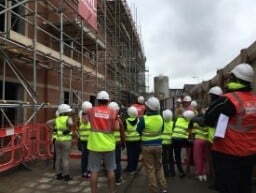 Hosting site visits during June 2016 and March 2017 at one of the company’s new-build developments in Roath, Cardiff for 60 Year 5 and 6 pupils from Albany Road Primary School to investigate real life on site as part of their class literacy project. Pupils had the opportunity to learn about health and safety, watch the busy site at work including a 100ft tower crane in use, concrete wagon deliveries, diggers and other equipment. They were each taught the signals to operate the crane and at the end of the day were presented with a Certificate and Willis Construction gifts. Jake Tinkling a young boxer from Risca who took up the noble art because he was being bullied in school. 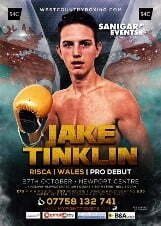 Jake has recently competed in his first pro fight which was televised by S4C on 27 October 2018. The company supported him by becoming his shorts sponsor. As part of its “healthy living and sport in the community initiative”, in September 2018 the company became the formal shirt sponsor for the next two years for Abersychan RFC by donating £350.00. In July 2018, the company became the Silver Level shirt sponsor of all home and away fixtures for the next two years by donating £200.00. to St Albans Rugby Football Club as part of its “healthy living and sport in the community initiative”. In June 2018 (as per 2014, 2015, 2016 and 2017), the company provided an annual sponsorship to the South Wales Police to fund various community based initiatives. In September 2017, the company helped raise £5,000.00 by participating in a golf day in aid of “Oliver’s Journey”. Oliver is a young child whose NHS funding had been cut and required £60,000.00 to cover his operation and rehabilitation. In April 2017, the company took part in a charity event organised by the Principality Building Society to raise money for the “Better Life Appeal”. This involved a donation along with competing in a charity golf day. In February 2017, the company sponsored a local cycling club to raise money for various local charities. In July 2018, the company sponsored and participated in the Principality Plastics Warehouse Charity Golf Day at the Glamorganshire Golf Club to raise money for Ty Hafan. In June 2018, the company took part in the MA Assist golf day in aid of the Oxford Young Adult Clinic charity. In June 2017, the company sponsored one of its insurance division Clients, Ellipta, to raise money for the Martha Trust by successfully taking part in the “Monte Carlo or Bust” car rally (all participating cars valued at under £200!) The Martha Trust supports people with profound physical and multiple learning disabilities and they encourage them to explore the world around them and take an active role in their community. In June 2017, the company took part in an MA Assist golf day and also donated money to the Oxford Young Adult Clinic charity who were supporting the daughter of the CEO’s daughter with her kidney transplant. 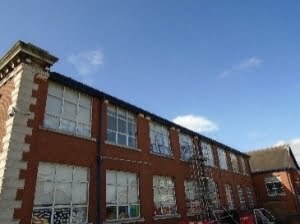 In March 2018, the company donated components, fixings, access equipment and labour to install 7 swift nesting boxes on the main building of St Peter’s Primary School in Cardiff. 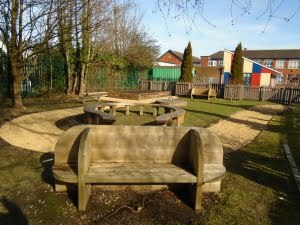 In February 2018, the company donated materials, labour and plant to create a hand’s on garden area for the children of St Peter’s Primary School in Cardiff. In April 2017, the company donated materials for Hafod Housing Association’s annual “Give and Gain” project to help a staff nominated community project. Dusty Forge is a small community centre in Cardiff that works in partnership with various fuel poverty initiatives and the project aim is to provide a building’s facelift. The centre has lost Communities First funding and established itself as a social enterprise. ed and furnished one of the Grangetown Boys’ Club rooms we have also used as a site meeting facility. The company has provided materials and support to enable the creation of the Alcohol Treatment Centre in Cardiff for Whitchurch Hospital. Our involvement was commended by Dr. Sharon Hopkins, Executive Director of Public Health. 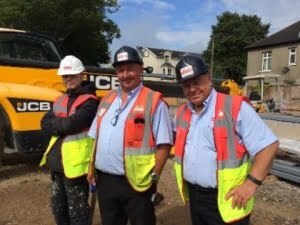 The company has worked with its supply chain to provide a kitchen, bathroom, shower and builders materials to the Llamau organisation to refurbish a property in Cardiff. The scheme acts as a transition property to develop independent living skills to its clients. Llamau is a homeless charity, delivering services to socially excluded homeless and potentially homeless young people and vulnerable women in South Wales. The company has donated surplus timber from its Cardiff Council contract to St Illtyds School for the construction of greenhouses. This satisfied both our social and environmental sustainability aspirations.